If the server is in the extended maintenance position, use this procedure to return the server to the normal rack position. Push the server back into the rack, as described in the following steps. 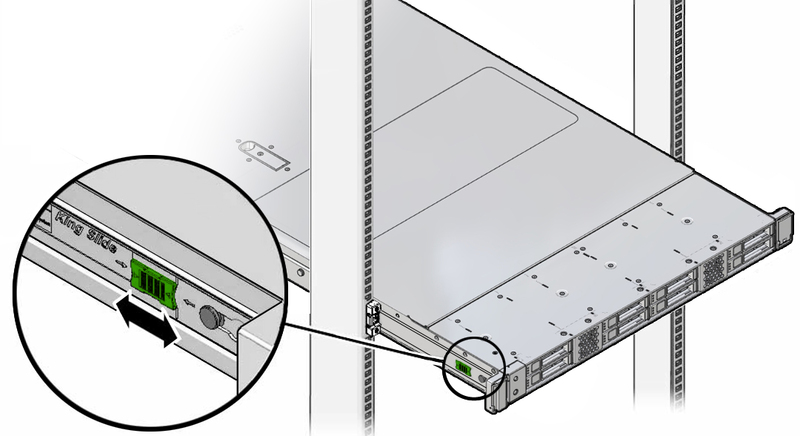 Simultaneously pull and hold the two green release tabs (one on each side of the slide rails on the server) toward the front of the server while you push the server into the rack. As you push the server into the rack, verify that the cable management arm (CMA) retracts without binding. Note - To pull a green release tab, place your finger in the center of the tab, not on the end, and apply pressure as you pull the tab toward the front of the server. Continue pushing the server into the rack until the slide-rail locks (on the front of the server) engage the slide-rail assemblies. You will hear an audible click when the server is in the normal rack position. If the CMA is not installed, that is, you removed it because you removed the server completely out of the rack, install the CMA. For installation instructions for the CMA, refer to Install the Cable Management Arm (Optional) in Oracle Servers X7-2 and X7-2L Installation Guide. If the cables are disconnected from the back of the server, that is, you disconnected the cables because you removed the server completely out of the rack, reconnect the cables. For instructions to reconnect cables to the back of the server, see Reconnect Data Cables and Power Cords. To identify the location of cable connectors on the back of the server, see Back Panel Connector Locations.